Where is the Message in this story? 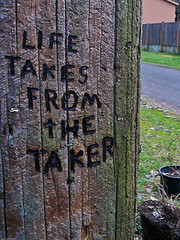 Life Takes From The Taker And Gives To The Giver! This story is about a man who drove from his home in Chicago to his homestate of New Jersey to help people who suffered damages after Hurricane Sandy. Imagine his surprise when finding out one of the lottery tickets he purchased in NJ was a $100,000 winner. For one man who traveled from Chicago to New Jersey to help clean up after Hurricane Sandy, the good karma from the effort cashed itself in early. John Turner, a 38-year-old Newark native who returned to New Jersey to help victims of superstorm Sandy, bought a lottery ticket while back home—and won $100,000. Turner, who lives in the Chicago area and runs National Catastrophe Solutions, a Chicago-based water cleanup service, drove 17 hours from the Windy City to the storm-ravaged Garden State last week. On Nov. 4, Turner bought several scratch-off lottery tickets at a Neptune, N.J., convenience store. One of them—a "Championship Poker" ticket—was a $100,000 winner. "Just shock," Turner told CBSNewYork.com of his reaction to the jackpot. "Like, this is not happening. This is not real." State lottery officials, though, confirmed the good karma. "We are very grateful that John has given his time and skills to help the people dealing with the challenges brought on by Sandy," New Jersey's lottery director said in a statement, "and that New Jersey is giving a memorable thank you back to him." Turner, who will collect $70,000 after taxes, plans to invest the money in his business and a local church, and to donate some to a family in need. He plans to return to help the Sandy-stricken tri-state area soon. "We saw houses moved down the streets, vehicles turned over," he told ABC's Chicago affiliate. "Some people didn't have insurance coverage. Some people never would have expected this. ... It's a saddening situation. We hope they get back to normal as quickly as possible." Awesome story! As a water mitigation company, we get to help a lot of people recover from an event some describe as the worst in their lives. It's a tough job, but just being able to know we're helping people recover and move on with their lives is reward enough. Of course, we'd love to hit the lottery while we're at it...hah!